Manufactures across numerous verticals are likely to continue to find effective ways so as to save costs, and adopting significant labelling has become an attractive modus to accomplish this objective. While selecting best-suited adhesive techniques, self-adhesive techniques secure higher advantages and competency. These are quality products with low costs compared to other type of labels and are compelled to the limits of the label design. Resistance to icy water and direct sunlight enhance the operating efficiency of these self-adhesive labels to 15% and more. 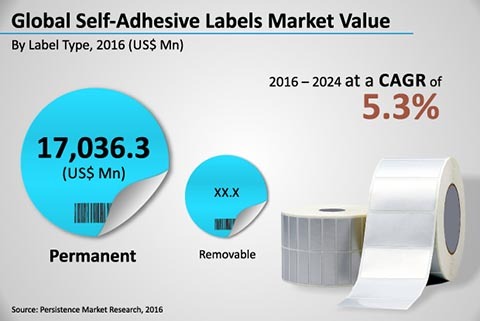 According to a research report offered by Persistence Market Research the demand for self-adhesive labels will remain higher and by the end of forecast period (2024), these labels will procure nearly US$ 33,940 Mn revenues. The global self-adhesive labels market is anticipated to increase at single-digit impressive CAGR to reach almost US$ 23,000 Mn by the end of 2024. It is also projected that about 29,000 sq. meters of self-adhesive labels are likely to be sold over the world by the end of 2020. Affordable price of self-adhesive labels compared to other labels is the key driving factor for growth of the market. The report further states that superior adhesive power offered by the self-adhesive labels is likely to keep enthralling manufactures towards its adoption. Moreover, increasing retail sector, especially in emerging markets for self-adhesive has resulted into emergence of modern retail formats that sell wide range of product categories in large quantities. The requirement of differentiating the packages on the shell have compelled label manufacturers to manufacture best quality labels. This will allow the manufacturers to fulfill two aspects - their client’s requirements, anda labelling and packaging objectives in food and retail industry. The report also highlights active participation of leading manufacturers in the growth of the market. Some of them are profiled in the report such as Thai KK, Fuji Seal International, Inc, Lintec Corporation, Symbio, Inc., PMC Label, Avery Dennison Corporation, UPM-Raflatac, and CCL Industries. According to the statistics provided by American Foundation for the Blind, approximately 20 Mn citizen in the US are blind. Manufacturers need to understand requirements of the market and should do active production accordingly. Government have now made it mandatory for the manufacturers to include braille labels on medical and pharmaceutical labels. Manufacturing of braille labels is likely to help manufacturers charter into wide market for blind people. Additionally, self-adhesive labels are emerging as an alternative to glue applied labels by reducing efforts to manually apply glue to each label. Additionally, eliminating manual process helps to reduce cost and Self-adhesive labels being automatic process are likely to be implemented for bulk application at higher pace.